TORONTO--(Marketwire - Feb 1, 2012) - Welcome to the month of love. As love-birds around the world start making their plans for Valentine's Day, the romance experts at Cheapflights.ca, the online leader in finding and publishing travel deals, are also getting in the spirit with it list of Top 10 Places to Propose. And, given that it's also a leap year, there is even more proposal potential. According to Irish folklore, every four years on February 29th, women can take matters into their own hands by popping the question on this day. So, to make sure there are plenty of ideas for places to take the leap, we've included the traditional and our suggested nontraditional options for ideal spots in each of these uber romantic destinations. After all, no matter who is doing the proposing, it's the question you hope you'll only ask once, and these hotspots offer both the romance and the "Wow!" factor that are key to pulling off the ultimate proposal. Here are five of Cheapflights.ca's Top 10 Places to Propose found in one of the most romantic places in the world -- Europe. London, United Kingdom - A private capsule on the London Eye with truffles and champagne is one way to do it, but our suggestion is the 17th-century Monument that stands in the heart of the City of London. Climb the 311 stone steps to the top -- as generations of others have before you -- and see the city laid out in all its ancient-meets-cutting edge glory. The candle with its fiery orb was built to mark the Great Fire of London. There's nowhere better to suggest love's eternal flame or a brand new start. Search and compare cheap flights to the United Kingdom. Paris, France - No, not the Eiffel Tower or Arc de Triomphe, glorious as they are. The Jardin du Luxembourg was much loved by writers such as Baudelaire, Balzac, Hemingway and Sartre and our favourite spot for a proposal is a shady one by the Medici Fountain. Commissioned by a king's widow in the 17th century, the focal point is the statue of Acis and Galatea, the young lovers watched over by the powerful Polyphemus. Search and compare cheap flights to France. Verona, Italy - "In fair Verona, where we lay our scene." Shakespeare lovers will know that Romeo and Juliet is set in the Italian city and there's a balcony at Juliet's House (off the Piazza delle Erbe) that is said to date from those times -- but don't be fooled. It was added in 1936. Forget about the Casa di Giulietta and take a stroll through the Giardino Giusti instead. From the lofty tower of the Renaissance garden are gorgeous, tower-dotted and timeless views of Verona. Search and compare cheap flights to Italy. Vienna, Austria - The Schonbrunn Palace, summer home of the Habsburgs, has a happy pedigree. It was where Empress Maria Theresa once lived in wedded bliss with her husband and 16 children. It's a noted proposing spot in the Imperial City, but another way to propose -- bit more Jane Austen perhaps -- is during a ball. This time of year is Ball Season in Vienna and there are more than 450 dances where you can play dress up and waltz like the Viennese of old. Search and compare cheap flights to Austria. Granada, Spain - The Alhambra, the ancient palace-citadel that sits high on a hill overlooking Granada, is one of the most romantic places in Spain. Its intricate design and beautiful gardens with tinkling fountains are paradise for lovers. It's a major tourist magnet so to mix up your Granada getaway, climb up to the Albaicin. The Arab quarter, that has heart-stopping views of the Alhambra, is a maze of cobblestone streets and small squares, balconies tumbling with bright geraniums and a magical air. Search and compare cheap flights to Spain. Whether you whisk your loved one across the world or prefer some place a little closer to home, Cheapflights.ca's list of Top Places to Propose has the perfect spot for you. Rounding out the list are Whitsundays, Australia; New Orleans, Louisiana; Agra, India; San Francisco, California; and Vancouver, British Columbia. To read the dreamy details about these romantic spots visit www.cheapflights.ca/travel-tips/top-10-places-to-propose/. 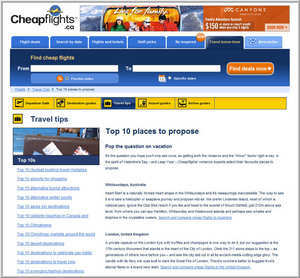 Screenshot of Cheapflights.ca's Top 10 Places to Propose in honour of Valentine's Day and leap year. It's the question you hope to only ask once, and these hotspots offer both the romance and the 'Wow!' factor that are key to pulling off the ultimate proposal.